So, I really enjoy planning lots of stuff for each week of CC, but I thought I'd show you what it is we are actually doing for Week 20 this week. This is Grismar's brilliant idea, and Mary loved it! Click here to read more about it on Grismar's new blog! All the materials cost me about $2, and it took under 10 minutes to cut the felt. Easy, cheesy! We got this idea from Sola Gratia Mom. Click here to see her post about the Layers of the Atmosphere craft. Pretty awesome! Then we had a snack and watched Felix Baumgartner's amazing free fall from the stratosphere. Mary really enjoyed that. 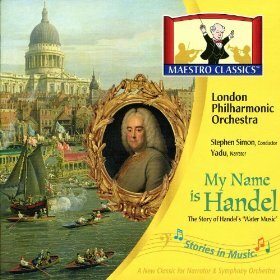 It tells the story of Handel's Water Music; we find it pretty entertaining and educational at the same time. I mix them up, and then she sings the little song and puts them in order. We also purchased the Musical Instrument Toob from Hobby Lobby ($5 with the 40% off coupon! ), and she sorts them into the four families of the orchestra. Surprisingly, there were no percussion instruments included, so we had to make some. I keep these in a little bag near our calendar, and she does it as part of Calendar Time. And that's it so far for our Week 20! Honestly, we won't do anything else for CC this week, except review the memory work by listening to the CD in the car. Mary likes to listen to Review (as we call the CD), because it helps her get ready for The Challenge on Funday Monday, which is still a big deal to her (woot!). I was thinking this morning, y'know, Mary is four-years-old. She's going to do all of this again when she's seven, and then again when she's ten (because the cycles repeat in Classical Conversations - one of reasons why I love, love, love CC). I'm not going to push it right now. If she shows a special interest in a subject, we go with it, and focus on that for the week. If not, no worries. Can you guess what they're cheering for? The Science experiment! How great! We talked about the layers of the atmosphere and pressure this week in class. Mary's tutor lit a piece of cardboard and stuck it down inside a glass jar with a very narrow neck. Then she placed a hard-boiled egg on top, and we watched the egg get sucked down into the bottle. Oh, the kids went wild! Awesome! Here's Mary at home with her story. So sweet! Happy Pi Day (3/14! ), by the way! love this melody! i think i'll make some music time period cards too! : ) i need help remembering. : ) & seeing the musical toob from hobby lobby just gives me one more reason to plan a trip there (alas our closest one is 40+ minutes away...). Thanks, Beth! You should certainly plan an Hobby Lobby trip, girl, you know it's just pure awesomeness! :) We've really enjoyed the music time period cards; I can tell they're helping both us remember them. Have a great week, friend!